The fun-loving singer-songwriter, who is a little over three months pregnant with her first child, recently dished on her pregnancy with Access Hollywood's Billy Bush — including those famous pre-baby cravings and mood swings. Pink won't be raising her glass anytime soon. Well, at least not for the next six or so months. "I've always had a really, really close relationship with all kinds of food, so I'm good there," Pink told Billy of her must-have foods, in an interview for The Billy Bush Show on Tuesday. "Sour Patch Kids, or Sour Skittles, sour anything. "Maybe that's a testament to myself," she joked. While she may not have fallen victim to the common cravings, the "Stupid Girls" singer admits that her temper has become a tad bit touchy due to her changing hormones. "I got into a fight at Bed Bath and Beyond," Pink told Billy. "I have the rage! "There was this man, and he was very rude. Something about Bed Bath and Beyond brings out the worst in people," she joked. "This man wanted a parking spot and he honked at me and he was literally an inch from my ear drum… I [went over to his car] and he acted like he couldn't see me, and then he acted like he couldn't speak any English." "Did he realize – did you see, 'He knows that I am the Pinkster?'" Billy asked. "I think he realized I was going to kill him!" Pink laughed. "And the poor bag boy [who] was helping me with my stuff wanted to be invisible." As for whether her maternal mood swings are heating things up in her relationship with her husband, motocross racer Carey Hart, the chart-topping star said it depends on the day. "My wife's been pregnant three times [and] each baby is different. Sometimes she's extra frisky, sometimes she's like, 'Get the heck outta my life, go away from me!' Where are you?" Billy asked. "I don't really know where I'm at," Pink told Billy. "It changes hourly." "Oh dear… So [Carey's] got a whole can of crazy on his hands?" Billy asked. "Oh yeah, a can and a half!" Pink answered. The 31-year-old mother-to-be, who recently released a compilation album on November 15 ("Greatest Hits… So Far!!! "), and is fresh off her energetic performance at the 2010 American Music Awards, told Billy that her next endeavor will soon be enjoying some hard-earned downtime. "I'm going to shoot a video in a week or two, and then I'm honestly going to take my first break since before I signer my record deal!" she told Billy. 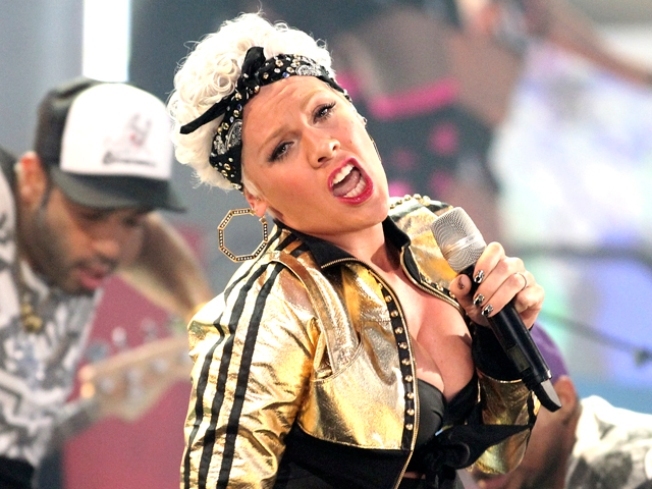 As previously reported on AccessHollywood.com, Pink confirmed her pregnancy on "The Ellen DeGeneres Show" on November 15. "I'm eating for two these days," Pink told Ellen at the time, providing her first confirmation that she is pregnant. The singer went on to explain why she was hesitant to confirm her pregnancy news, despite the speculation in the media. Just like many women, including pop star Mariah Carey (who also recently announced that she's pregnant), Pink revealed that, at one point, she tragically suffered a miscarriage. "I didn't want to talk about it because I was just really nervous and I have had a miscarriage before," she told Ellen.